We proudly present our third newsletter! Having started the Smart Cities and Communities project mySMARTLife in December 2016, we are now well into our project and a lot of actions take place: sustainable energy and mobility solutions are implemented, new ICT services developed, engagement with citizens is being taken to a new level and we have set up a mySMARTLife Cities Network. innovative energy usage in the mySMARTLife project, from smart control and batteries to smart heating islands and photovoltaic plants. Discover the latest actions in our Lighthouse Cities Nantes, Hamburg and Helsinki to make their cities more environmentally friendly and read also what else is going on in the Smart Cities community! One of the objectives of the EU funded mySMARTLife project is to reduce the CO2 emissions of cities and to make the demonstration cities more environmentally friendly. 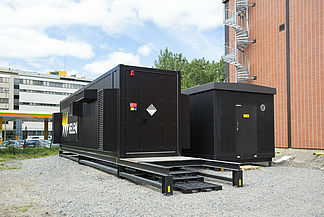 In the following article, we want to shine a light on how smart control and batteries provide flexibility for electrical grids in the Lighthouse City Helsinki. We will also present outstanding energy projects in the Lighthouse Cities Nantes and Hamburg. 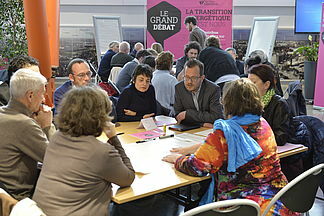 Lighthouse City Nantes has published the roadmap “Nantes, metropolis in transition” outlining on how it will successfully achieve its energy transition. Citizens and local stakeholders from the 24 cities of Nantes Metropole have developed this outstanding roadmap. The energy roadmap is a result of the Great Debate “Energy transition is us” which took place in Nantes from September 2016 to March 2017. Zero-emission mobility is important for cities to achieve a sustainable urban development. Therefore, the public authority vehicle fleet of the borough of Bergedorf will be renewed and electrified with e-cars. Moreover, it will be enriched with micro-mobility concepts such as e-bikes and last mile people movers. 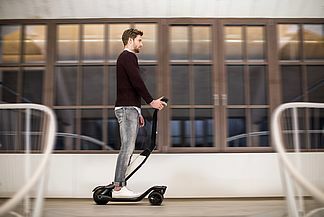 In the case of Bergedorf, this will be an innovative new product, the Cityskater. Lighthouse City Helsinki has made a significant step forward on its path to cut carbon dioxide emissions and reach carbon neutrality by launching its Energy and Climate Atlas. The 3D atlas is a tool for implementing energy efficiency improvements in buildings. The City of Helsinki has compiled extensive energy-related data on the Helsinki building stock into the atlas and makes it freely available as open data. A solar energy analysis produced with Energy and Climate Atlas. 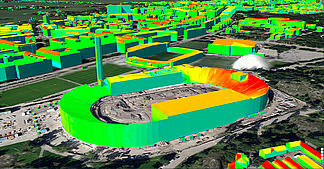 The analysis shows the sunniest spots at Helsinki Olympic Stadium (picture: City of Helsinki). The Institute for Business Competitiveness of the Junta de Castilla y León together with CARTIF Technology Centre will organise the BY&FORCITIZENS Conference on “Smart Regeneration of Cities and Regions”: a forum to gain comprehensive insights into the opportunities and challenges brought by city transformation strategies across Europe. The event is co-organised by mySMARTLife and further SCC1 projects. Nordic Edge aims at being one of Europe’s most important arenas for knowledge exchange and inspiration to creators of smarter businesses, smarter homes and smarter cities. This year, there will be a central pavilion in the exhibition area dedicated to cities and municipalities. mySMARTLife will also be represented at the joint SCC1 projects booth! 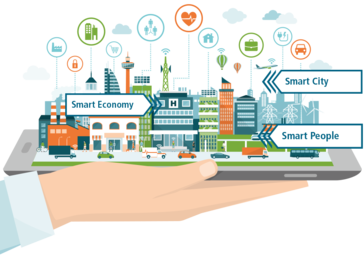 mySMARTLife is one of twelve European Smart Cities and Communities Lighthouse projects, currently receiving funding within the European Union's Horizon 2020 Research and Innovation programme. SCIS' podcast - Urban Reverb - reports from Helsinki! The Smart Cities Information System (SCIS) is a knowledge platform to exchange data, experience and know-how and to collaborate on the creation of Smart Cities. It also gives a voice to the twelve European Smart Cities and Communities Lighthouse projects. From now on, Anthony Colclough from EUROCITIES will produce podcasts for the Smart Cities Information System. In "Urban Reverb", he will interview anyone who is either directly involved in Smart City projects (such as politicians and engineers) or who is somehow affected by the outcomes of innovative and smart solutions (such as tenants). The mySMARTLife project aims at making the three Lighthouse Cities of Nantes, Hamburg and Helsinki more environmentally friendly by reducing the CO2 emissions of cities and increasing the use of renewable energy sources. Other activities are focusing on "Inclusive cities", offering a high quality of life in the cities. If you do not wish to receive any more information about mySMARTLife activities, you can unsubscribe from our newsletter here.